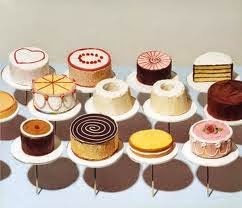 When I started thinking about people I'd like to interview...Mr. Thiebaud was at the top of my list!! Though I really enjoy his older pieces...pies, cakes, candies, and such....I LOVE his landscape paintings! He is a living legend!!!! However...I figured I'd probably not get a response. Here was the first reply. 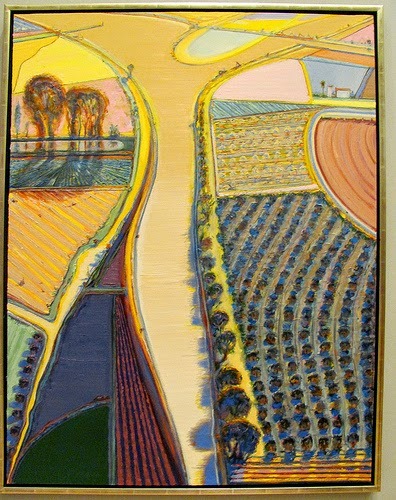 "Mr. Thiebaud does not use a computer. However, I can relay the questions to him. There is no guarantee that he will respond. He is inundated with requests on a daily basis. 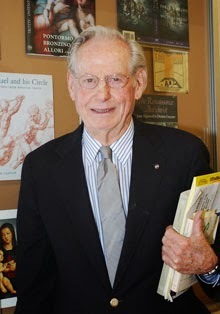 At the age of 93 (94 in November), he does not "work" too much on tasks outside of those in his own studio and at his home. But, it is worth a shot." BUT HE DID!! HE DID RESPOND!!! 1) Did you have art classes in elementary, middle, and/or high school? If so, how much of an impact did it have on you?
" I do recall several "art" classes in elementary schools in southern California. Mostly very general drawing projects and classroom group mural works. High school provided more specific opportunities. Classes in drawing and watercolor taught by a woman who had been instructed by an experienced person Long Beach Polytechnic High School housed a major auditorium attended by the civic public for “major” events. The stage manager and technician instructed us in the designing and building and painting of sets in a professional manner." 2) What was your family/friends response to your desire to be an artist? 3) What words of encouragement/inspiration do you have for those desiring to pursue a life of art? "Obtain as much professional formal instruction as possible and work very hard." 4) What is your motivation to continue creating art? "Love of and long looking at fine works of art." I think that is so neat! Way to go Mr. E! That is so neat! Way to go Mr. E! WOW- How exciting! (I live very close to "Poly High") I love his landscapes as well. Thanks for sharing! So So very awesome, one of my kids did an artwork inspired by his work so I am going to show him this interview. I am always amazed at how the art community rallies around kids!! OH my gosh!!! I LOVE THIS!! He is one of my favorite artists!!!! Congrats Ted! OMG YOU AREMY HERO. This is sooooooooo cool!!! Awesome! We wrote back to him back in 2006 and he also wrote back. What a kind artist and teacher. THAT IS AWESOME!!!! What a great idea!!! Where do these come from!!!! Love what you do! What a fantastic idea. I'm sure you were floored when he actually responded. Keep it up, Ted! Ha! That's wild! What a treat.